Originaly, this board - Meteo v2, was designed like replacement of general analog thermometer which costs ~1 USD. But, thanks to comments of makers, the board was redesigned to versatile board which you can use for everthing you need. Meteo v3 is the latest version of board and you can easily connect I2C devices (sensors, ADC, DAC, LCD), 1-wire sensors and control output devices with 2 GPIOs which are connected to female header. 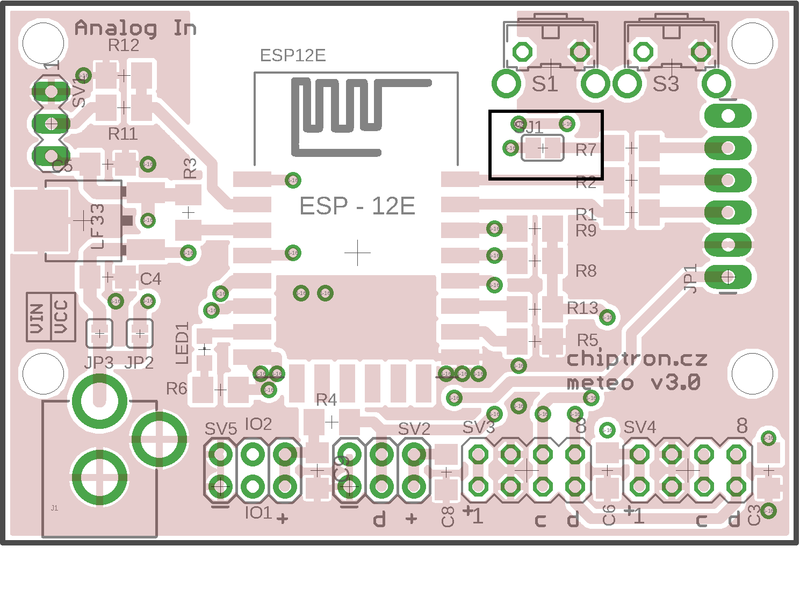 This project Meteo v3 is not only board used for thermometer. 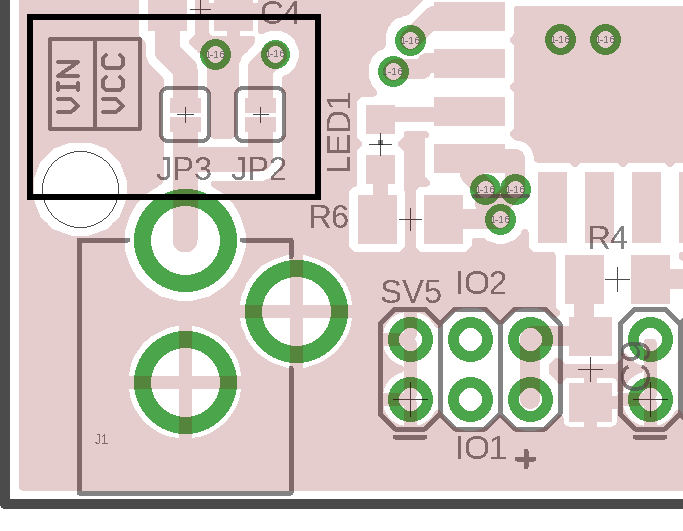 There is a lot of improvements (DC-DC connector for power, 1-wire bus, GPIOs) may be used for more projects, just what you need. The power may be 3.3V (JP2 solder bridge) or 3.8 - 16V when you close JP3. If you want to upload the code to board, unplug DC-DC connector! The connector for connection of USB-UART converter was modified and added by 5V power supply. The programming connector is compatible with this module. The board is powered from 5V output of USB-UART converter. The board now includes 2x3 female header for connection of devices with 1-wire bus. External resistor (4k7) is connected to DATA which is connected to GPIO0 of ESP8266. The pinout of I2C bus was modified and now is directly compatible with these sensors. If you want to use different sensor, just change the connection. If you are using Arduino IDE, you can easily upload your code to board - at first, add link to Manager in Preferences. If you want to upload your code, unplug DC-DC connector! For programming in Arduino IDE or others tools, press the FLASH button before the uploading. Then you enabling of uploading. You can release the FLASH button after the message "Uploading" in terminal (of Arduino IDE). Instead of pressing of FLASH button, you can close DATA of 1-wire bus with GND. After the upload, remove the jumper. 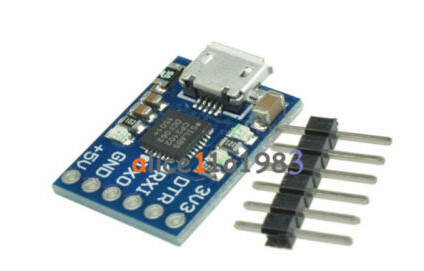 The powering of board can be done by 5V output of USB-UART connector or DC-DC connector. Be careful, if you want to connect USB-UART, uplug the DC-DC connector. The input voltage from DC-DC connector you choose by soldering of bridge (JP2, JP3). If you short JP2, maximum voltage is 3.6V, recommended 3.3V. If you short JP3, the power voltage may be from 3.8V to 16V. The minimum voltage is based on minumum power voltage of ESP8266 plus 0.5V (drop on LDO), it means the minimum voltage is 3.8V. A new revision of board includes two GPIOs. They are labeled like IO1(MeteoV3.0); IO12(meteoV3.1) and IO2; IO14. GPIOs are without protections so be careful with using of that. 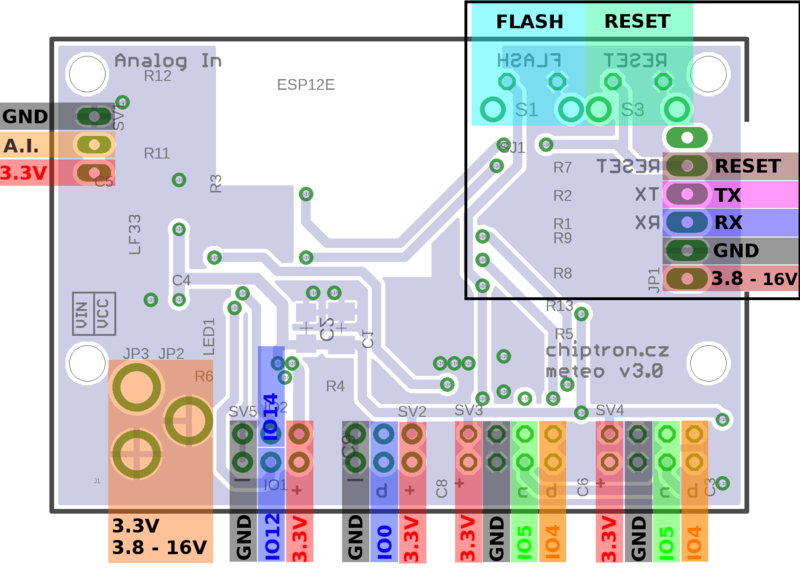 If you want to switch the relay, do that with transistor. Both pins are with female pins of GND and 3.3V. The popularity of 1-wire is extremly high, the most popular sensor is DS18B20 - temperature sensor. The sensor can be powered by two options - usual or parasite. There is 4k7 resistor which is connected between DATA and 3.3V. The connection of sensor and LCD is done by I2C connector. These connectors are four so you can connect a lot of I2C devices. The maximum length of wires is limited by capacity of wires (400 pF). Clock and Data are connected to GPIO5 and GPIO4, there are designed pull-up resistors (R8 and R9) which you can assemble. ESP8266 contains only one ADC, the maximum voltage of analog input is 1000 mV. If you want to connect device with higher output voltage, you have to use prepared resistors divider. 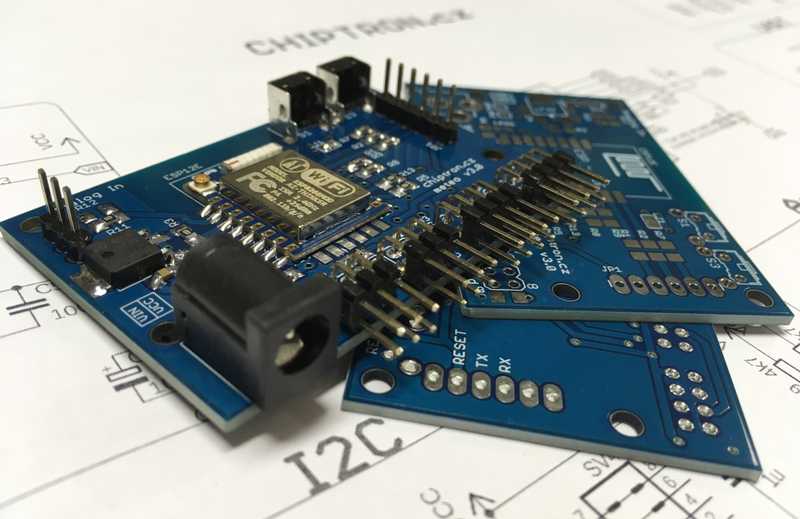 If you need mote Analog inputs, you can use external I2C ADC, which you can connect to I2C connectors on board. In case you want to save energy from battery, you can use a few low power modes. 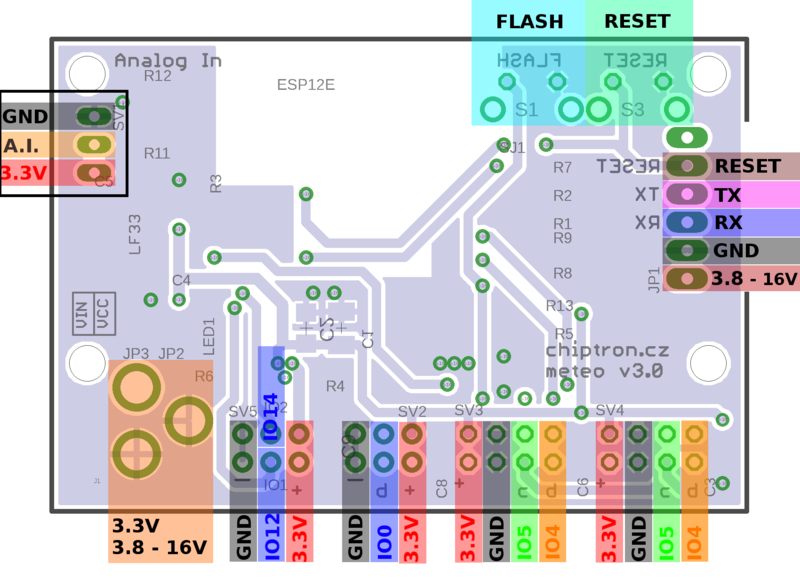 If you want to use DeepSleep, you have to short SJ1 - then you short GPIO16 and RESET and the ESP8266 is correctly restarted (after the timeout of DeepSleep). 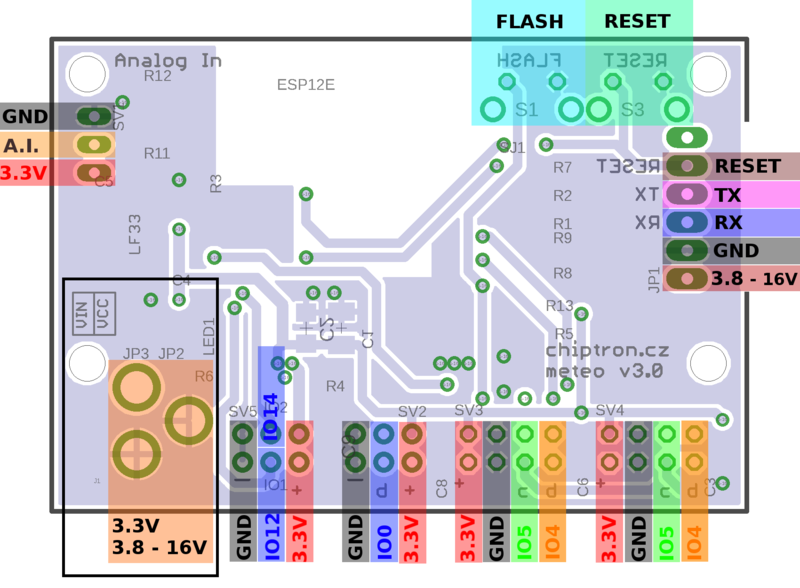 You can find a few examples with this code - LED blinking, PIR sensor (connected to GPIO12), DS18B20 with 1-wire bus, I2C sensors (Si7021 and BMP180), OLED and more. Don't hesitate and write your own codes and share it!